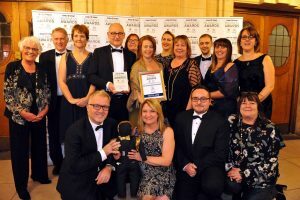 Ruth Lee Ltd, a leading manufacturer of rescue training manikins for the fire and rescue services (FRSs), has had its impressive growth in international markets acknowledged and celebrated, as the company was named Welsh Exporter of the Year. The Daily Post Business Awards celebrates outstanding businesses in North Wales. At a glittering awards ceremony held at Bangor University, the team at Ruth lee Ltd were delighted to be presented with an award for their achievements in export. Ruth Lee Ltd has produced manikins specifically for the FRS for almost 30 years. In recent years, however, demand for the company’s extensive range of rescue training manikins has grown worldwide, to the extent that Ruth Lee now exports 70% of production abroad. In the past two years alone, the export business has grown by 75% and the company now exports to all corners of the globe, including North and South America, Australia, many European countries, the Middle East and several Asian countries. Paul McDonnell, Managing Director, said, “After many years working with the UK’s fire and rescue service to develop manikins fit for the rigours of the industry, we were thrilled to have our considerable growth in international markets recognised at the Business Awards. “It was an honour to be part of such a prestigious ceremony, which recognised some truly outstanding businesses across North Wales. We feel honoured to be counted amongst these, and privileged to be named Welsh Exporter of the Year. “We work with a fantastic network of distributors across the globe to supply manikins to countless rescue organisations, including fire and rescue services. It is very encouraging to see that other countries are following the UK’s lead when it comes to rescue training and investing in equipment which helps them to train more effectively.